Find the code for this example on GitHub. Our last example, Blinky operates at about 2Hz, which is really two cycles per second, each cycle having an on and an off phase that is 0.25 seconds long. So ONE way to get to 1Hz, is to trigger a state change on every other signal. First we set up registers ‘flop1’ and ‘flop2’, to be 0 and 1 respectively. This is their state at power-on, after the configuration is initialized. This means that a set digital logic steps is run each time Out2Hz fires (which is a clock signal we generated previously in Blinky). Specifically, the events are fired on the positive edge of the clock signal. You could also trigger events at the ‘negedge’ of the clock signal. In the wild, posedge is much more common. 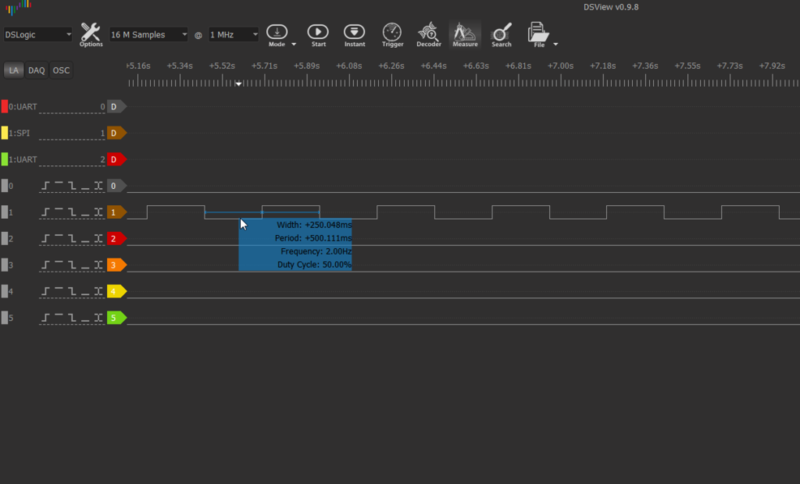 A clock is a funny thing in Verilog. It MIGHT mean something connected to an actual digital oscillator (like CPUs have), but often it means act as a trigger when something happens. So you could be monitoring a digital signal, and you only want to do something when it goes from 0 to 1 (positive edge), then you could use an always block. This is what you would do if you want to recreate a CPU with an FPGA, as in execute a set of instruction on each clock tick. Doing something at each clock tick, along with counters and registers, allow you to have some concept of time. The statements inside the block always execute at each occurrence of the clock signal (specifically the positive edge of it, in our example). If flop1 was 0, and flop2 was 1, then after one clock tick, flop1 is 0 and flop2 is 1. What you are doing is swapping the values with each other RIGHT at the moment of posedge for each clock tick. In Verilog, the order of statements does not matter, as you are describing a configuration of logic gates, not a program. If flop1 was 0, and flop2 was 1, then after one clock tick, flop1 is 0 and flop2 is 0. Consider that you want to use the <= when you want every change to happen at once, and in particular if you want to preserve the value of a variable till the ‘upcoming posedge’ execution state (as when we want flip1 and flop2 to be meaningful values after that <= until the instantaneous transition occurs). Use = when logic by necessity must be sequential. Consider a design guideline that using = is a crutch or a handcap, and should be avoided. Most often there is a more “Verilog” way of accomplishing something rather than a series or =. You have to break out of the habit of designing a configuration as if you where writing executable code with a programming language. Usually a state machine, or counter is a better option. We switch 1 and 0 states on flop 2 once each clock cycle. Since Out2Hz fires twice per second, flip2 lands on the 0 value once a second. Meanwhile, the LEDn is assigned to flop2, turning the LED on each time flop2 is 0 (driven to ground). // IMPORTANT - This oscillator has very poor accuracy - do not depend on it for critical timing. If pins are not used, it may be a good idea to drive them to a known state. input that will set the count to zero on each clock edge for which it is set (logic high). could be developed to provide a more predictable control. // Without specifying bits and bit sizes of constants and variables, all defined bits are used. // understand in this simple example.